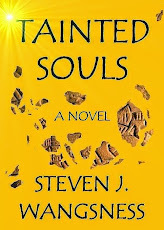 It's always nice to wake up to another great review, describing Tainted Souls' "many twists and turns that keep you wondering," which you can find here at Amazon (or click on the "Reviews" page). On a cloudy, gray, cold day in Seattle -- I know you're asking, "Is there any other kind of day in Seattle?" but the answer to that is a definite "Yes," at least most years -- it's a great pick-me-up to go along with my Starbuck's instant decaf (coffee maker has been broken since before Christmas). I'm always amazed by the writers who claim they don't read their own reviews. Why deprive yourself of that kind of joy? There's nothing quite as gratifying as getting a great review from some reader who doesn't even know you. Congrats on the cheery review to brighten a gray day. And for more cheer: you're a winner in our DECADES contest. Stop over at our blog and pick up your copy of Ruth Harris's bestseller.